31 Mar 2019 -- Patrick Brady, Professor of Physics and current Director of the Leonard E Parker Center for Gravitation, Cosmology and Astrophysics at the University of Wisconsin Milwaukee, has been elected spokesperson of the LIGO Scientific Collaboration. He succeeds outgoing spokesperson David Shoemaker. More information about Patrick can be found here. 26 Mar 2019 -- LIGO is set to resume its hunt for gravitational waves—ripples in space and time—on April 1, after receiving a series of upgrades to its lasers, mirrors, and other components. LIGO now has a combined increase in sensitivity of about 40 percent over its last run, which means that it can survey an even larger volume of space for gravitational-wave events like black hole collisions. (Left Image): Detector engineers Hugh Radkins (foreground) and Betsy Weaver (background) are pictured here inside the vacuum system of the detector at LIGO Hanford Observatory, beginning the hardware upgrades necessary for Advanced LIGO's third observing run. [Image credit: LIGO/Caltech/MIT/Jeff Kissel]. 27 Feb 2019 -- LIGO and Virgo are pleased to announce that the strain data from the O2 observing run have been released. These data are now available through the Gravitational Wave Open Science Center (gw-openscience.org). The O2 observing run began on November 30, 2016 and ended on August 25, 2017. The release includes over 150 days of data from each of the two LIGO observatories, as well as 20 days of data from Virgo, making this the largest data set of “advanced” gravitational wave detectors to date. Observations in O2 include seven binary black hole mergers, as well as the first binary neutron star merger observed in gravitational waves, all recently published with the GWTC-1 catalog. The LIGO Scientific Collaboration and Virgo Collaboration have published a number of papers based on these data; please see the LIGO Scientific Collaboration web pages for a list of these papers, and several more will be appearing soon. Along with the strain data, the release contains detailed documentation and links to open source software tools. O2 is the second observing run of Advanced LIGO, and the first observing run of Advanced Virgo, which joined O2 on August 1st, 2017. Data from Advanced LIGO’s first observing run (O1) are already available online, and have been used in a number of scientific publications, text books, artistic projects, and classroom activities. As with previous data releases, the O2 data set should be useful for both scientific investigations and educational activities. Image adopted from arXiv:1811.12907 by the LIGO Scientific Collaboration and the Virgo Collaboration. 15 Feb 2019 -- Research grants from the NSF, along with UK and Australian funding agencies, will fund a future upgrade to the twin LIGO detectors. The $35 million upgrade---called "Advanced LIGO Plus"---will use squeezed light and new mirror coating technologies to increase the sensitivity to gravitational-waves. Advanced LIGO Plus is expected to commence operations in 2024, increasing the volume of space the observatory can survey by as much as seven times. This will lead to a higher rate of detections, improvements to tests of general relativity, and a better understanding of neutron star physics. Funding for the upgrade includes $20.4 million from the NSF, $14.1 million from UK Research and Innovation, and additional funds from the Australian Research Council. For more information see the LIGO Lab press release, the the UKRI press release, and the NSF press release. 3 Dec 2018 -- The LIGO Scientific Collaboration and the Virgo Collaboration have released the results of their search for stellar-mass coalescing compact binaries during the first and second observing runs using an advanced gravitational-wave detector network. This includes the confident detection of ten binary black hole mergers and one binary neutron star merger. Four of the ten black hole mergers are being reported for the first time and include the most distant and massive gravitational-wave source ever observed (GW170729). For more information see the press release and the ligo.org detection page for the O1/O2 Catalog. 21 Nov 2018 -- The LIGO Laboratory has announced the winners of the first Award for Excellence in Detector Characterization and Calibration: Derek Davis (Syracuse University) and T.J. Massinger (Caltech). The $1000 prize will be shared by Davis and Massinger; they are invited to present colloquia at one of the LIGO Lab sites and will be recognized at the March 2019 LIGO-Virgo Collaboration Meeting. Additional details on their award can be found on the LIGO Laboratory news website. 1 Nov 2018 -- Claims in a paper by Creswell et al. of puzzling correlations in LIGO data have broadened interest in understanding the publicly available LIGO data around the times of the detected gravitational-wave events. The features presented in Creswell et al. arose from misunderstandings of public data products and the ways that the LIGO data need to be treated. The LIGO Scientific Collaboration and Virgo Collaboration (LVC) have full confidence in our published results. We are preparing a paper that will provide more details about LIGO detector noise properties and the data analysis techniques used by the LVC to detect gravitational-wave signals and infer their source properties. The entire gravitational-wave signal data stream from the first observing run is already publicly available at the Gravitational-Wave Open Science Center, along with additional information on analyzing LIGO data. This resource, along with presentations from a recent Open Data Workshop, will be of interest to all who wish to understand our results in more depth. 18 Oct 2018 -- Three LSC scientists were awarded the 2019 New Horizons in Physics prize. Rana Adhikari (Caltech), Lisa Barsotti (MIT), and Matthew Evans (MIT) were recognized “for research on present and future ground-based detectors of gravitational waves.” The New Horizons prize is awarded by the Breakthrough Prize Foundation. The LSC congratulates their colleagues on this major recognition. For more information see the Breakthrough Prize press release and the LIGO Lab news item. 16 Oct 2018 -- Exactly one year ago the LIGO Scientific Collaboration and Virgo Collaboration announced the detection of the binary neutron star merger GW170817 - the first ever cosmic event viewed in both gravitational waves and light. This remarkable discovery was made by the LIGO and Virgo detectors on 17 August 2017, and the aftermath of the merger was subsequently observed by thousands of astronomers around the world – marking an exciting new dawn for “multi-messenger” astronomy. You can re-live the excitement of our GW170817 press conference or read more about the binary merger on our GW170817 detection page. And our latest results on the physical properties of neutron stars, from our observations of GW170817, have just been published in Physical Review Letters. Meanwhile, preparations continue for the start of LIGO’s Third Observing Run, planned for early in 2019, with the promise of many more gravitational wave detections to come. Read more about our exciting “O3” plans. 12 Jul 2018 -- The LIGO Scientific Collaboration (LSC) congratulates members of the IceCube Collaboration on discovering the first ever evidence that links high-energy cosmic neutrinos to the nuclei of active galaxies powered by supermassive black holes. This remarkable discovery, confirmed by electromagnetic telescopes around the world, illuminates a century-old puzzle about the origins of high-energy cosmic rays and marks a major breakthrough for the emerging new field of multi-messenger astrophysics. The LSC looks forward to the global network of gravitational-wave detectors beginning their next observing run, and the exciting prospect of detecting electromagnetic radiation, gravitational waves, and neutrinos from the most powerful astrophysical events in the cosmos. For additional information see the associated NSF press release. 24 Apr 2018 -- LIGO's second observing run (O2) ended on August 25, 2017, and preparations for the third observing run (O3) began shortly thereafter. The detector installation and commissioning program between O2 and O3 has generally been proceeding well at all the LIGO and Virgo detector sites. Along with this progress we have also incurred delays in the start of full interferometer commissioning. As as result, the start of O3 is currently projected to begin in early 2019. Updates will be provided once the installation phase is complete and the commissioning phase has begun. An update on the engineering run prior to O3 will be provided by late summer 2018. 15 Nov 2017 -- The LIGO and Virgo Collaborations detected another binary black hole merger on June 8, 2017. The gravitational waves were detected by the twin LIGO detectors. With components 12 and 7 solar masses, this is the lightest binary black hole merger observed so far. For additional information read the news release at the LIGO Lab page. See also the ligo.org detection page for GW170608. 16 Oct 2017 -- For the first time, scientists have directly detected gravitational waves — ripples in space-time — in addition to light from the spectacular collision of two neutron stars. This marks the first time that a cosmic event has been viewed in both gravitational waves and light. The discovery was made on August 17, 2017 using the U.S.-based Laser Interferometer Gravitational-Wave Observatory (LIGO); the Europe-based Virgo detector; and some 70 ground- and space- based observatories. For more information see the press release, the ligo.org detection page for GW170817, and the LIGO Lab page for GW170817. 11 Oct 2017 -- Scientists representing LIGO, Virgo, and some 70 observatories will reveal new details and discoveries made in the ongoing search for gravitational waves. This will take place on Monday, October 16th, at 10:00am EDT at the National Press Club in Washington, D.C. A live-stream of the press conference can be viewed at this link. An alternate link will also carry the live-stream, followed by a 30-minute YouTube question & answer session with gravitational-wave scientists. For additional information see the full media advisory here [pdf]. 3 Oct 2017 -- The LIGO Scientific Collaboration is absolutely delighted to congratulate Rainer Weiss, Barry Barish, and Kip Thorne on winning the 2017 Nobel Prize in Physics. Weiss and Thorne are two of the founders of the LIGO project. Barish was the Principal Investigator of LIGO from 1994 to 2005, during the period of its construction and initial operation. For more information see the announcement on the Nobel Prize website, and news releases at LIGO Laboratory, Caltech, and MIT. 27 Sep 2017 -- The Virgo Collaboration and the LIGO Scientific Collaboration have jointly observed the merger of two black holes. This is the fourth confirmed detection of a binary black hole merger, and the first detection made using a network of three interferometers. For more information see the press release, the ligo.org detection page for GW170814, and the LIGO Lab page for GW170814. 1 August 2017 -- On August 1, 2017 the Virgo detector began taking science-quality data in concert with LIGO. While LIGO and Virgo have operated together in the past, this marks the first time they are jointly taking data after significant upgrades to both detectors. This 2nd observing run (O2) began at the end of November 2016 and will continue until August 25, 2017. Virgo, located near Pisa, Italy, began taking engineering-mode data alongside the two LIGO detectors in mid-June. Since that time the Virgo team has been working to hunt down sources of instrument noise and improve the stable operation of the interferometer. Besides providing further confirmation of any detected events, the addition of Virgo is expected to improve their sky localization by an average factor of 2 or better. At the end of O2 both detectors will return to improving their sensitivities in preparation for the next joint observation run (O3, currently scheduled to begin in Fall 2018). For more information see the Virgo press release. Recent claims in a preprint by Creswell et al. of puzzling correlations in LIGO data have broadened interest in understanding the publicly available LIGO data around the times of the detected gravitational-wave events. We see that the features presented in Creswell et al. arose from misunderstandings of public data products. The LIGO Scientific Collaboration and Virgo Collaboration (LVC) have full confidence in our published results, and we are preparing a paper in which we will provide more details about LIGO detector noise properties and the data analysis techniques used by the LVC to detect gravitational-wave signals and infer their waveforms. 7 July 2017 -- The second Advanced LIGO run began on November 30, 2016 and is scheduled to end on August 25, 2017. The run was suspended on May 8 for some in-vacuum commissioning activities at both sites; it resumed on May 26 at LIGO Livingston Observatory and on June 8 at LIGO Hanford Observatory. As of June 23, approximately 81 days of Hanford-Livingston coincident science data have been collected. The average reach of the LIGO network for binary merger events has been around 70 Mpc for 1.4+1.4 Msun, 300 Mpc for 10+10 Msun and 700 Mpc for 30+30 Msun mergers, with relative variations in time of the order of 10%. As of June 23, 8 triggers, identified by online analysis using a loose false-alarm-rate threshold of one per month, have been identified and shared with astronomers who have signed memoranda of understanding with LIGO and Virgo for electromagnetic followup. One of these triggers has been confirmed by offline analysis, given the name GW170104, and published on June 1. A thorough investigation of the data and offline analysis are in progress; results will be shared when available. Advanced Virgo has joined the network for few days in June in engineering mode, performing full tests in preparation for the triple-observing run planned for later this summer. 17 June 2017 -- For the first time, all three second generation interferometers---LIGO Hanford, LIGO Livingston, and Virgo---are simultaneously in a locked state. (When an interferometer is "locked" it means that an optical resonance is set up in the arm cavities and is producing a stable interference pattern at the photodetector.) Virgo is joining in an engineering mode, in preparation for the full triple-observing mode planned for later this summer. Congratulations, Virgo! 1 Jun 2017 -- The LIGO Scientific Collaboration and the Virgo collaboration confirmed a third gravitational wave event in data from the Advanced LIGO detectors in Livingston, Louisiana, and Hanford, Washington, USA. The detected waves—observed on January 4th, 2017 at 10:11:58.6 UTC (5:12AM EST) —were produced by a binary black hole system. Stellar-mass black holes with 31.2 and 19.4 solar masses merged to produce a spinning black hole of 48.7 solar masses. The detected signal is completely consistent with the predictions of general relativity. Press release at LIGO Lab site [ pdf version]. More information can be found at the ligo.org detection page for GW170104 and the LIGO Lab page for GW170104. 29 March 2017 -- David Shoemaker, MIT senior research scientist, was elected spokesperson of the LIGO Scientific Collaboration. Shoemaker was the leader of the Advanced LIGO project. He succeeds outgoing spokesperson Gabriela González. More information can be found on the MIT press release. 9 March 2017 -- Ronald William Prest Drever, co-founder of LIGO and emeritus professor of physics at Caltech, passed away on 7 March 2017 at the age of 85. A full obituary can be found on the Caltech website, the Scotsman, and Science Magazine. 27 January 2017 -- Present and past leaders of the LIGO Laboratory and the LIGO Scientific Collaboration were recognized with major prizes by the National Academy of Sciences and the American Astronomical Society. The entire LIGO Team was recognized by the UK Royal Astronomical Society. On January 25th the High Energy Astrophysics Division (HEAD) of the American Astronomical Society (AAS) awarded the Bruno Rossi Prize to Gabriela González and the LIGO Scientific Collaboration (LSC). The Rossi Prize is awarded annually to recognize "a significant contribution to High Energy Astrophysics, with particular emphasis on recent, original work." González is a professor of physics and astronomy at Louisiana State University (LSU) and has been the LSC spokesperson since 2011. More information about the award can be found on the AAS website. On January 26th the National Academy of Scienes (NAS) awarded the Henry Draper Medal to Barry Barish and Stan Whitcomb, and the NAS Award for Scientific Discovery to Gabriela González, David H. Reitze, and Peter R. Saulson. The Henry Draper Medal is awarded every four years and honors "a recent, original investigation in astronomical physics, of importance and benefit to science to merit such recognition." Barry Barish is the Linde Professor of Physics, Emeritus at the California Institute of Technology. Barish was the Principal Investigator of LIGO from 1994 to 2005, during the period of its construction and initial operation. Stan Whitcomb is the LIGO Laboratory Chief Scientist at the California Institute of Technology. Whitcomb has been working on gravitational-wave detection since 1980; he led the team that designed and commissioned the initial LIGO detectors and helped train the team that built Advanced LIGO. More information about the award can be found on the website for the 2017 NAS Henry Draper Medal. The NAS Award for Scientific Discovery is presented every two years for "an accomplishment or discovery in basic research, achieved within the previous five years, that is expected to have a significant impact on one or more of the following fields: astronomy, biochemistry, biophysics, chemistry, materials science, or physics." The 2017 award recognizes the first three elected spokespersons of the LIGO Scientific Collaboration: Saulson, Reitze, and González. (Rai Weiss was the first spokesperson of the LSC). Peter Saulson is the Martin A. Pomerantz ’37 Professor of Physics at Syracuse University. David Reitze is the Executive Director of LIGO Laboratory at Caltech and a Professor of Physics at the University of Florida. The award recognizes the role of the current and past spokespersons in leading the LIGO team to the first direct detections of gravitational waves in 2015. More information can be found on the webpage for the 2017 NAS Award for Scientific Discovery. On January 13, 2017 the UK Royal Astronomical Society (RAS) awarded their 2017 Group Achievement Award in Astronomy to the LIGO Team, in recognition of the first direct detection of gravitational waves. More information can be found at the RAS news release. 3 December 2016 -- On Sunday, December 4th, at 10ET/9c, tune into the National Geographic channel to watch LIGO and other remarkable scientists and mathematicians receive this year’s Breakthrough Prizes. The star-studded ceremony will be hosted by Morgan Freeman, and will include a performance by Alicia Keys. In May of this year, LIGO was named the recipient of a Special Breakthrough Prize in Fundamental Physics. This “Special” prize (separate from the 'regular' Breakthrough Prize) can be awarded at any time by the selection committee, which includes an impressive array of internationally renowned scientists. Previous winners of the Special Prize include seven leaders of the Large Hadron Collider teams that discovered the Higgs Boson. This time, the $3 million dollar prize acknowledges LIGO’s historic detection of gravitational waves and the subsequent empirical confirmation of the most difficult-to-detect predication of general relativity. The prize will be shared between LIGO founders Ronald W. P. Drever, Kip S. Thorne and Rainer Weiss, and 1012 contributors to the discovery. The Breakthrough Prize in Fundamental Physics was founded in 2012 by Yuri Milner to recognize those individuals who have made profound contributions to human knowledge. 30 November 2016 -- After a series of upgrades, the twin detectors of LIGO, the Laser Interferometer Gravitational-wave Observatory, have turned back on and resumed their search for ripples in the fabric of space and time known as gravitational waves. LIGO transitioned from engineering test runs to science observations at 8 a.m. Pacific Standard Time on November 30. 12 October 2016 -- Gravity Spy, a crowdsourcing tool for finding and analyzing glitches in LIGO data, has been publicly launched today. Glitches, or noise, in the LIGO data are a byproduct of very high sensitivity of LIGO instruments. The presence of these non-gravitational-wave disturbances in the data can obscure or mimic true gravitational-wave signals. The origin of some glitches is well-understood, while others remain a mystery. The rates at which the glitches occur vary depending on what's going on with the detectors and their environments. At their highest rates, glitches happen at 3x/sec. At such rates and with more than 2 dozen types of glitches observed so far, it takes an enourmous amount of data processing to sort out and classify them. To facilitate this process, the Gravity Spy tool is crowdsourcing the glitch identification to citizen scientists. With each new classification, LIGO will move closer and closer to discovering new gravitational-wave signals by identifying possible noise patterns in its data and filtering them out. Read more, and sign up, at the Gravity Spy website. The Gravity Spy tool is a result of collaborative efforts of several LSC groups. The Gravity Spy team consists of LIGO researchers at the Center for Interdisciplinary Exploration and Research in Astronomy (CIERA) at Northwestern University, LIGO researchers at Caltech, machine learning researchers at Northwestern University, crowd-sourced science researchers at Syracuse University, and Zooniverse web developers. 14 September 2016 -- Today LIGO celebrates the 1st anniversary of its gravitational-wave detection. 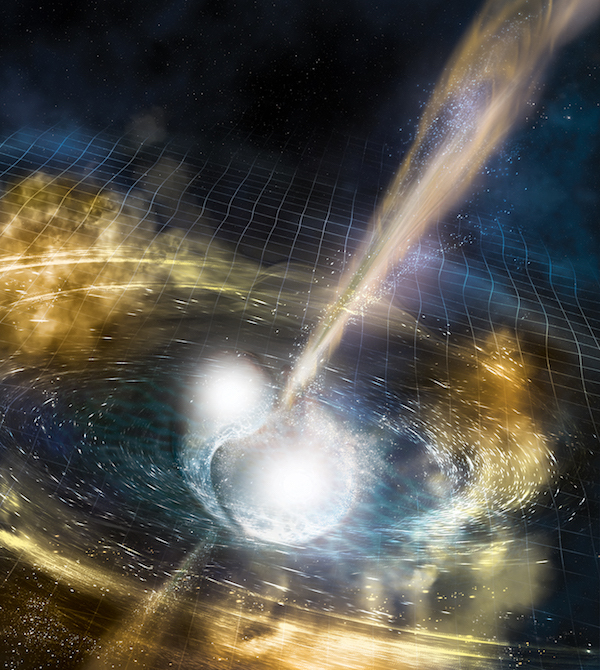 Read this article about how this historic discovery was made, and about its significance for the future of gravitational-wave astronomy, at the LIGO Lab website. 7 September 2016 -- The Advanced LIGO Engineering Team has been awarded the Paul F. Forman Team Engineering Excellence Award from the Optical Society. This award recognizes technical achievements such as product engineering, process, software and patent development, as well as contributions to society such as engineering education, publication and management, and furthering public appreciation of optical engineering. In addition to members of the LIGO Laboratory at all 4 locations, the team includes individuals from Albert Einstein Institute and Laser Zentrum Hannover, Glasgow University, Rutherford Appleton Laboratory, Standford University, and University of Florida. (See the full list of Advanced LIGO awardees.) The award will be presented at the Frontiers in Optics, the 100th OSA meeting that will take place in October 2016, followed by an article in Optics & Photonics News on the winners. LIGO Chief Engineer Dennis Coyne and LIGO Senior Optical Engineer GariLynn Billingsley will collect the award on behalf of the Advanced LIGO team. Congratulations to all the team members! 6 September 2016 -- The LIGO Scientific Collaboration would like to congratulate the LISA Pathfinder team on the fantastic success of their space satellite mission. This technology test mission has demonstrated acceleration noise at mHz frequencies which is better than required for the full LISA mission, and interferometric readout noise which far better than required. The Pathfinder triumph shows that LISA technology is sound, and paves the way towards multi-wavelength gravitational wave astronomy, as advocated in the recent US National Academy of Science "Review of Progress Toward the Decadal Survey Vision in New Worlds, New Horizons in Astronomy and Astrophysics". LISA, together with LIGO, its partners, and future ground-based detectors, will make it possible to "listen" to the universe over a frequency band that is more than 30 octaves wide. We can hardly wait to discover this unknown world! 15 June 2016 -- The LIGO Scientific Collaboration and the Virgo collaboration identify a second gravitational wave event in the data from Advanced LIGO detectors. On December 26, 2015 at 03:38:53 UTC, scientists observed gravitational waves — ripples in the fabric of spacetime — for the second time. The gravitational waves were detected by both of the twin Laser Interferometer Gravitational - Wave Observatory (LIGO) detectors, located in Livingston, Louisiana, and Hanford, Washington, USA. More about this detecton at this website and the LIGO Lab website. 2 June 2016 -- Three founders of LIGO are the recipients of the prestigious Kavli Prize in Astrophysics. The Kavli Foundation announced that Ronald W.P. Drever (Caltech), Kip S. Thorne (Caltech) and Rainer Weiss (MIT) are the 2016 awardees of the $1 million prize. The prize, which is awarded every 2 years, recognizes "scientists for their seminal advances in three research areas," including Astrophysics, Kavli Prize website states. The three founders of LIGO are being honored for "their ingenuity, inspiration, intellectual leadership and tenacity [which] were the driving force behind [the] epic discovery" of gravitationa waves, the prize citation reads. 31 May 2016 -- The three researchers who founded LIGO have been awarded the 2016 Shaw Prize in Astronomy, The Shaw Foundation announced. Ronald W.P. Drever (Caltech), Kip S. Thorne (Caltech) and Rainer Weiss (MIT) are the recipients of the $1.2 million prize, awarded annually. According to the prize citattion, the award recognizes their collective work on "conceiving and designing the Laser Interferometer Gravitational-Wave Observatory (LIGO), whose recent direct detection of gravitational waves opens a new window in astronomy, with the first remarkable discovery being the merger of a pair of stellar mass black holes." 4 May 2016 -- The three principal founders of LIGO, along with the entire LIGO discovery team, have been awarded The 2016 Gruber Prize in Cosmolgy, the Gruber Foundation announced. Ronald W.P. Drever (Caltech), Kip S. Thorne (Caltech), and Rainer Weiss (MIT) will each receive a gold medal and will share a $500,000 award. 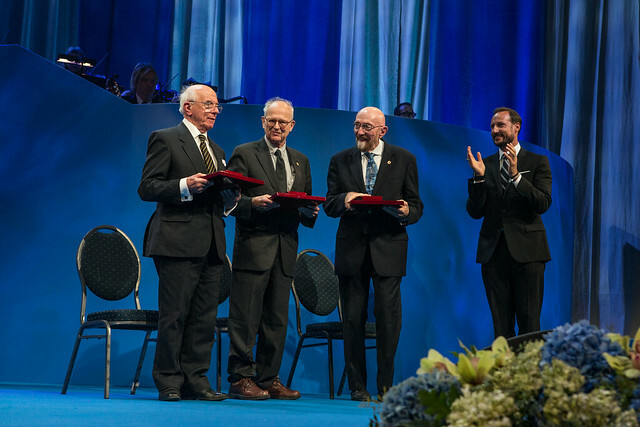 The Prize citation reads: "The Gruber Foundation proudly presents the 2016 Cosmology Prize to Rainer Weiss, Kip Thorne, Ronald Drever, and the entire LIGO team for pursuing a vision to observe the universe in gravitational waves, leading to a first detection that emanated from the collision of two black holes. This remarkable event provided the first glimpse into the strong‐gravity regime of Einstein's theory of general relativity that governs the dynamics of black holes, giving direct evidence for their existence, and demonstrating that their nature is consistent with the predictions of general relativity." 2 May 2016 -- Members of the LIGO and Virgo collaborations have been awarded a Special Breakthrough Prize in Fundamental Physics, the Prize Selection Committee announced. The award recognizes "the scientists and engineers contributing to the momentuous detection of gravitational waves", which was announced by LIGO on Feb 11, 2016, stated the announcement by the Selection Committee. The Special Breakthrough Prize can be awarded at any time in recognition of an exceptional scientific achievement. The $3 million prize will be shared as follows: the three LIGO founders -- Ronald W.P. Drever (Caltech); Kip S. Thorne (Caltech); and Rainer Weiss (MIT) -- will share $1 million; and the 1012 contributing scientists, engineers, and staff will share $2 million. From the NSF website: "Today, National Science Foundation (NSF) Director France A. Córdova signed a Memorandum of Understanding (MOU) to lead the way for establishing an advanced gravitational-wave detector in India. The MOU was also signed by representatives from India's Department of Atomic Energy and India's Department of Science and Technology." Read the NSF Press Release. 24 February 2016 -- As a follow-up to the announcement of LIGO's first observation of gravitational waves, the House Committee on Science, Space, and Technology has asked LIGO Scientific Collaboration members to testify on the discovery, its meaning for science and society, and what the future may hold. LSC members to testify at the Full House Committee Hearing were the LIGO Lab Executive Director David Reitze, the LSC Spokesperson Gabriela Gonzalez, and the LIGO MIT Director David Shoemaker. Details at house.gov. 17 February 2016 -- The LIGO-India project has been formally approved by the Union Cabinet. The formal approval will clear the path for funding of the LIGO-India project, as well as for other activities that are critical for the start of building a gravitational-wave detector in India. Read an article in The Hindu. Einstein was right! Congrats to @NSF and @LIGO on detecting gravitational waves - a huge breakthrough in how we understand the universe. On Feb 12, 2016, John P. Holdren, Assistant to the President for Science and Technology and Director of the White House Office of Science and Technology Policy, posted a statement on the White House blog with congratulations to the LIGO team. Read the full statement on https://www.whitehouse.gov/blog. 11 February 2016 -- For the first time, scientists have observed ripples in the fabric of spacetime called gravitational waves, arriving at the earth from a cataclysmic event in the distant universe. This confirms a major prediction of Albert Einstein's 1915 general theory of relativity and opens an unprecedented new window onto the cosmos. The gravitational waves were detected on September 14, 2015 at 5:51 a.m. Eastern Daylight Time (9:51 a.m. UTC) by both of the twin Laser Interferometer Gravitational-wave Observatory (LIGO) detectors, located in Livingston, Louisiana, and Hanford, Washington, USA. The LIGO Observatories are funded by the National Science Foundation (NSF), and were conceived, built, and are operated by Caltech and MIT. The discovery, accepted for publication in the journal Physical Review Letters, was made by the LIGO Scientific Collaboration (which includes the GEO600 Collaboration and the Australian Consortium for Interferometric Gravitational Astronomy) and the Virgo Collaboration using data from the two LIGO detectors. "As members of the LIGO Scientific Collaboration, we recognize the importance of diversity to enrich our research and scholarship. We pledge to provide a welcoming, inclusive environment to talented individuals regardless of characteristics such as, but not limited to, physical ability, race, ethnicity, gender, sexual orientation, economic status, or personal religious practices, and to support the professional growth of all collaboration members. We also pledge to work to increase the numbers of women and under-represented minorities that actively participate in the LSC, to pursue recruitment, mentoring, retention and promotion of women and under-represented minority scientists and engineers and to maximize their contribution to excellence in our research. As a collaboration, we will strive to create a professional climate that encourages inclusion and that respects and values diversity."